Rio Grande’s Rachel Haddad had the first of the RedStorm’s two goals in Thursday’s 2-2 tie with Ohio Christian University at Trailblazer Field in Circleville, Ohio. CIRCLEVILLE, Ohio — While it wasn’t a loss, it was certainly a result which didn’t help the University of Rio Grande’s hopes of hosting at least one postseason game. The RedStorm scored early to take a quick lead, but needed a late goal to forge an eventual 2-2 tie with Ohio Christian University, Thursday afternoon, in River States Conference women’s soccer action at Trailblazer Field. 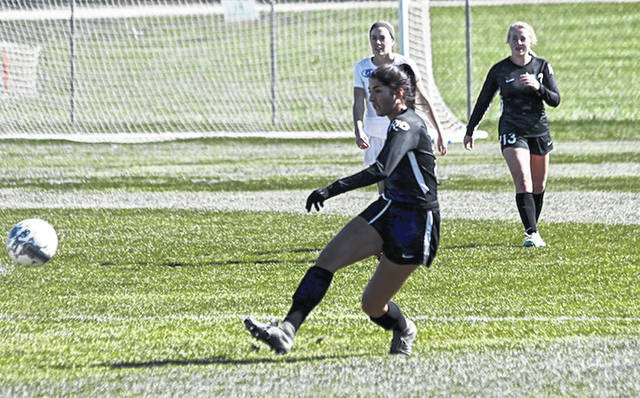 The deadlock left Rio Grande at 5-8-2 overall and 3-3-1 in conference play. The RedStorm now also find themselves as part of a four-way tie for fourth place in the RSC standings. The top six teams will qualify for the league’s post-season tournament, with the No. 3 and No. 4 seeds earning a first round home game. Ohio Christian moved to 5-6-3 on the season and 2-2-2 inside the RSC. The Trailblazers — along with WVU-Tech and Indiana University East — are also part of the four-way tie. Rio Grande got the scoring underway quickly when junior Rachel Haddad (Gallipolis, OH) netted an unassisted marker just 3:55 into the match – a shot which got over the outstretched arms of OCU goal keeper Kim Lloyd and ricocheted off the crossbar and into the goal. The Trailblazers knotted the score with 9:31 left before the intermission thanks to a Brooke Lezotte goal off an assist by Mylie Lafountaine and took a 2-1 advantage on a goal by Emmily King – thanks to an assist by Seree Petersen – just 1:39 into the second half. That’s how things stayed until Rio tied the score at 2-2 with 5:51 left in regulation when junior Brooklyn Pritt (Scott Depot, WV) headed in a right side crossing pass by sophomore Payten Davis (Chillicothe, OH). The RedStorm managed to more shots on goal in regulation and another in the first overtime session, but failed to net a would-be game-winner. Ohio Christian failed to get off a shot of any kind over the final 26:05 of regulation and in either of the two 10-minute overtime sessions. Rio Grande finished with a 16-11 edge in shots overall and an 11-8 advantage in shots on goal. Senior Andrea Vera (Quito, Ecuador) finished with six saves in goal for the RedStorm. Lloyd had nine stops for the Trailblazers. Rio Grande returns to action next Thursday at Asbury University. Kickoff is set for 4:30 p.m.